is a collection of technologies released by Adobe Systems for the development and deployment of cross platform rich Internet applications based on the proprietary Adobe Flash platform. The initial release in March 2004 by Macromedia included a software development kit, an IDE, and a J2EE integration application known as Flex Data Services. Since Adobe acquired Macromedia in 2005, subsequent releases of Flex no longer require a license for Flex Data Services, which has become a separate product rebranded as LiveCycle Data Services. In February 2008, Adobe released the Flex 3 SDK under the open source Mozilla Public License. Adobe Flash Player, the runtime on which Flex applications are viewed, and Adobe Flex Builder, the IDE built on the open source Eclipse platform and used to build Flex applications, remain proprietary. Google was yesterday named as the UK's top consumer brand for the first time in a study by Superbrands. Google has this year beaten Microsoft who have held the title for the previous 2 years and moved up 2 places from 3rd. The biggest worldwide search engine has beaten some old and established prominent brands and now leads the way as the UK's Superbrand. The list in general illustrates the importance of the technology and media sector to the UK market - as along with Google and Microsoft, the BBC, Sony and Apple rate highly. Other strong performers here are the some members of the automotive world, the drinks giant Coca-Cola, the sports behemoth Nike and an assortment of household goods suppliers. Being the most popular brand in the UK just illustrates how important searching on the internet has become as this is now a mainstream media distribution channel that is only going to grow further. * Word of mouth - I'll start with a simple one - let your friends know about it. They'll be dead impressed and insanely jealous :) Word of mouth can work wonders you know, online and offline. * Get links - As your blog is online a lot of visitors can be got by getting lots and lots of lovely links from other websites. Know someone who has a website? Drop them a mail letting them know and maybe they will be happy to give you a link. * Search engines - Search engines like Google and Yahoo can provide you with tons of visitors if they like your blog. Writing entries with lots of useful and descriptive content is one way to do this. Search engines love content that is valuable to other people. Write nice decriptive titles for all of your blog entries. For example if you are posting photos from your holiday in Dublin, Ireland than rather than calling the entry "Photos" be descriptive and call it "Photos from my holiday in Dublin, Ireland". That way someone searching for photos of Dublin will find your blog. * Forum signatures - If you are a member of any other forums sometimes you can sometimes place a link into your signature (the text that appears under every post you make). This is a perfect place to add a link to your blog. * Email - Send an email to any of your friends that may be interested to read your blog. * Post on the forum - Everytime you make a post on the GardenStew.com forums you will see a link appear that points to the last blog entry that you wrote. Posting more often on the forums will greatly increase the chances that someone will read your post and follow the link to your blog. Once they read your blog once they will be hooked and will return again and again. * Write a great blog - If you write an excellent quality blog you will appear higher because your blog will get more views. Since you will appear higher than the other blogs in the lists you will get more people who will click on your blog. If you are looking for the perfect video game controller like a joystick, steering wheel or perhaps something a bit more extreme like a full immersion gaming chair this is the place for you. Reviews of all types of gaming peripherals and how-to's on choosing the best one for your needs. If your dad is a PC gamer and you need some good gift ideas for a special occasion anything from this list of the top gifts for PC gamer dads will fit the bill. This list includes all sorts of items from different categories and price ranges. Give dad anything from this list and earn some serious brownie points. Saitek has a new gamepad for PC called the Saitek Cyborg Rumble Pad that has a unique feature. The control is customizable to your preference with a movable joystick. To find out how well the Saitek Cyborg Rumble Pad performs read on. Why should your hands do all the work when it comes to gaming? With the Fragpedal Elite USB Gaming Footpedal, your feet can get in on the gaming action too. With the Fragpedal Elite USB Gaming Footpedal you can bind game commands to two foot pedals making gaming more fun and giving you more options for controls in game. Flight simulation games can be made all the more realistic with the use of a good flight control system such as the Saitek X52 Pro up for review today. The Saitek X52 Pro is a great HOTAS system with a separate joystick and throttle that flight sim fans will love. Traditionally one of the biggest short comings I see with gaming keyboards is not in the gaming function, but rather most often it is the keyboard function. Ideazon is trying to remedy that problem with their New Fang Gamepad. The Fang has all the good of the typical Ideazon design and allows me to keep my normal keyboard for typing. Razer makes some of the best and coolest gaming peripherals on the planet. Razer has recently announced the addition of a Professional series of products aimed at design pros and business users. This interview asks a few questions about the additional product line. The Thrustmaster Ferrari GT 2-in-1 Racing Wheel is a cool Ferrari branded racing steering wheel for both PC and PS2. The Thrustmaster Ferrari GT 2-in-1 Racing Wheel also has rumble force feedback. The Thrustmaster Rechargeable Wireless 2-in-1 dual Trigger Gamepad is a gamepad that will work with both your PC and your PS2. The Thrustmaster Rechargeable Wireless 2-in-1 dual Trigger Gamepad is wireless and has good range. The Thrustmaster Rallye GT Pro Force Feedback steering wheel is the only five axis steering wheel controller available currently for PC. The five axes allows you to have progressive handbrake, inside view and clutch. Voice Buddy Interactive Game Control software turns your voice into a game controller. Simply set up your voice commands with the Voice Buddy Interactive Game Control software and tell your game what you want it to do. Fans of Flight simulation games often need particularly specialized joysticks and other gear to get the most realism out of their flights. This list is some of the top flight sim gear to both improve your game and make it more realistic. The Saitek X52 Flight Control System is a great throttle and joystick intended for use with flight simulation games. The Saitek X52 Flight Control System has numerous programmable switches to allow you to keep your hands on the joystick rather than the keyboard. The CH Products FighterStick USB is authentically modeled after the F-16's flight stick. With over 132 programmable functions, the CH Products FighterStick USB is the ultimate flight sim joystick. The CH Products Pro Throttle USB is one of the most functional and realistic F-16 style throttle control you will find. The CH Products Pro Throttle USB features numerous programmable buttons and switches and has great feel during play. CH Products Pro Pedals USB are a great product for flight simulation fans. The CH Products Pro Pedals USB are designed to be used as the rudder pedals for added realism in flight sim games. The CH Products Pro Pedals USB can also be used for the brake and gas pedals for racing sims as well. Flight simulation fans tired of flying with a plain old joystick, the CH Products Flight Sim Yoke USB is your ticket to more realistic flights. The CH Products Flight Sim Yoke USB looks for all the world like the yoke inside a Cessna. The CH Products USB Throttle Quadrant is a throttle quadrant that is designed to give flight simulation fans the realism they desire in flight. The CH Products USB Throttle Quadrant has six levers and six buttons. There are a wealth of cool joysticks available to make PC gaming more enjoyable. This top picks guide will help you decide which joystick is the best for you. 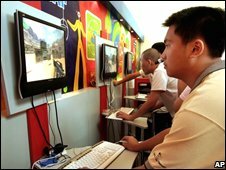 Gamers have very different needs in computer peripherals than non gamers do. A keyboard that works great for data entry my fail miserably for gaming. The perfect mouse for Excel may get you fragged in your favorite game. this list has 10 of the best gifts for gamers. The Logitech MOMO Racing Steering Wheel is an excellent force feedback steering wheel that makes driving games so much more enjoyable it is shocking. The force feedback function of the Logitech MOMO Racing Steering Wheel adds greatly to the realism of driving games. The Saitek Cyborg Evo Force Joystick is a really cool joystick that can be used by right or left handed gamers alike. The Saitek Cyborg Evo Force Joystick also features a customizable handle for different size hands. There are many types of gaming peripherals available from mice and keyboards to joysticks & game pads. Sometimes choosing the best gaming peripherals can be difficult. The Logitech Cordless Rumble Pad 2 Gamepad is a great PC game controller. With a button layout very similar to the controller for Play Station 2, many gamers will already be familiar with the feel and layout of the Logitech Cordless Rumble Pad 2 Joystick. When I play games, I want my PC to be able to generate as many frames per second as possible; it's a measure of the strength of the CPU and GPU solution which is used consistently in gaming benchmarks to show which processor and/or graphics card is better. My PC can beat up your PC if I can generate eye candy at a whopping 130fps and you can only do a mere 100. Why then are home theater PC folks so obsessed with playing back at a paltry 24 frames per second when graphics solutions (including integrated graphics) are easily able to send out 60? Okay, so it's not an actual bug, it's just a bad pun. But the key is the word "judder". To understand why it matters, we must understand how films are made. Motion pictures in 99% of Hollywood cinema are recorded at 24 frames per second and then each frame is strobed twice before the next frame is indexed. In effect, film in theaters is displayed at 48Hz, though the actual content is 24Hz. Historically speaking, TVs are 60Hz (to match the AC frequency of the wall socket; in other countries with different wall socket frequencies, the TV rate is different). While I won't get into the specifics or the full history here (there are lots of sites out there which cover why this was so and how it was compensated), the major understanding to carry forth is that in order to get 24 frames of content into something that is refreshed 60 times per second, you have to repeat frames in an irregular way. In short, the first frame in every second is repeated 3 times, the second frame is repeated 2 times, the third frame is repeated 3 times, the fourth is repeated 2 times, etc. This process is known as "3:2 pulldown", and you can see from the math that if you repeat 12 frames 3 times each and 12 more frames 2 times each, you will get 60. So all of the picture content makes it onto the television screen, so everything's great, right? Alas, the human eye is only partially fooled: on scenes with high amounts of motion or where the camera pans across a landscape, the phenomenon known as "judder" manifests. The motion should be smooth, but you can see some jerkiness to it due to the fact that every other film frame is of slightly different duration. This isn't a new problem: film has been 24fps for a long time, and TV has been 60Hz for almost as long. When TVs were interlaced the issue was reduced because at the transition between the 3-frame and the 2-frame the middle frame was essentially a mix of the two (again, not going into the specifics on interlacing history). Nowadays, TVs are made with non-interlaced (aka "progressive") components and you can see the judder artifacts better. There are ways around this; people with computer monitors have a bit more flexibility with their refresh rates than TV users traditionally do. Setting the graphics to output at 72Hz generates a nice image (since 72 is an even multiple of 24), but the vast majority of television sets won't accept 72Hz signals. And while there are some computer monitors you could reasonably call "home theater worthy", most are a bit small and limited. As I mentioned, this is not a new issue, but until now most sources were interlaced (even DVDs are generally interlaced, though flags in their software exist so progressive player hardware can pick out the original frames) so the issue wasn't high profile. With new technology like Blu-ray, the video is stored as 24 actual pictures per second, and the only limiter left is the display. Of course, when you're a Consumer Electronics manufacturer, any nifty gadget you can add to your TV to distinguish yourself from your competition is a good one, and someone got the bright idea to include inputs which would accept and display 24fps. Everyone else soon followed, and now a lot of mid- to high-end equipment has the ability to take in images at 24fps and display it at some multiple of that (technology in the generic TV set has changed enough to decouple it from the original 60Hz number). Early drivers for the 945G, G965, G33, and G35 were all capable of 24Hz output. You had to play tricks on them sometimes to convince them they could do a resolution/refresh they didn't know about by default, but if you got the drivers to accept that they could do it the chipset graphics would deliver 24fps goodness. After all, theoretically in sheer processing power it should be easier than the normal 60fps; any integrated graphics chip should be able to do it. In reality, there were some difficulties, and they remain today. Desktop work at 24fps was fine, but watching media at 24fps exhibited very jerky behavior every several seconds or so... then returned to silky smooth motion once more. This was across a variety of software players-- both free and consumer-- and across multiple motherboards and chipsets. And didn't manifest on either ATI or Nvidia graphics... suggesting, once more, that this was a problem with the drivers. (It's vaguely possible this is a hardware issue with the chipsets, whose design concentration would logically have been "ensure high refresh rates".) There was some sign this might be modulated by the renderer used (EVR vs VMR) as well as by the presence of extra frames in the source files, but as of the 15.7 drivers there manifested a new problem: all support for 24fps is gone. Whether your EDID is advertising the 24fps capability or not, even if you use the trick I linked to above, the resolution won't show up as selectable in the Intel drivers. 48Hz still seems to work fine... but as there are only a handful of TVs which accept 48Hz signalling, this is small consolation. It could be that someone on the driver team recognized that 24fps was broken and removed it, or there could be something else going on that's even more mysterious. It could entirely be an oversight. But the fact is, even if you want jerky 24fps on Intel graphics you now have to use older drivers, keeping yourself in the past and avoiding fixes you might want for other bugs. I haven't gotten my hands on a G45 system yet, so I don't know if this issue is fixed on newer graphics chipsets yet, but I sure hope so. You'll note that these three issues just happen to be the ones I've covered in my blog. This is not coincidence. I've seen internal presentations, and if our drivers meet or exceed the hardware the G45 is going to be a great chipset from a home theater standpoint. But it's important that we address the enthusiast in this space (because the enthusiast is going to tell his friends what to buy) and the enthusiast sees all three of those issues as important to have solved in a quality system. So far I've not noticed a driver release which fixes any one of them. I don't know that any of our Graphics (or Audio) folks read this blog, but I sure hope so. On June 30 2008, Microsoft officially ceased sales of Windows XP to all major retailers and PC manufactures like Dell, HP, Lenovo etc. Gmail has a security feature which most free online email services still lack. It is the ability to use SSL (Secure Socket Layer) or more simply a Secure Connection. The Online Tech Tips Blog digs into Vista's Start Search box—which earned an honorable mention in our recent Hive Five app launcher roundup—and details how to make it even more convenient by adding quick searching of Wikipedia, Google, or nearly any other site with a search interface. We've shown you how to perform super-quick "I'm feeling lucky" searches from Start Search, but this tutorial digs into opening up a whole results page. If your Vista lacks a Group Policy Editor, the How-To Geek has a registry-editing solution that should work just as well. Typically when Microsoft ships a new OS (like Windows Vista), we immediately start talking about the next version-which begs two questions: 1) is Microsoft working on a new version of Windows, and if so, 2) why aren't you talking about it? Windows 7 (formerly known as Blackcomb and Vienna) is the working name for the next major version of Microsoft Windows as the successor to Windows Vista. Microsoft has announced that it is "scoping Windows 7 development to a three-year timeframe", and that "the specific release date will ultimately be determined by meeting the quality bar." Windows 7 is expected to be released by 2009 or near January 2010. The client versions of Windows 7 will ship in both 32-bit and 64-bit versions. A server variant, codenamed Windows Server 7, is also under development. I thought I would spend a minute giving you an update on where we are. First, yes, we are working on a new version of Windows. As you likely know, it's called Windows 7.We are always looking for new ways to deliver great experiences for our customers. This is especially true of Windows - where we're constantly examining trends in hardware, software and services to ensure that we continue to drive the innovation that has both made Windows the world's most popular operating system and has provided a foundation on which our partners built great products and businesses. When we shipped Windows 2000, we were already working on Windows XP and we started working on Windows Vista even before we released Windows XP. So naturally, we've been thinking about the investments we made in Windows Vista and how we can build on these for the next version of Windows. What is a little different today is when and how we are talking about the next version of Windows. So, why the change in approach? We know that when we talk about our plans for the next release of Windows, people take action. As a result, we can significantly impact our partners and our customers if we broadly share information that later changes. With Windows 7, we're trying to more carefully plan how we share information with our customers and partners. This means sharing the right level of information at the right time depending on the needs of the audience. For instance, several months ago we began privately sharing our preliminary plans for Windows 7 with software and hardware partners who build on the Windows platform. This gave them an opportunity to give us feedback and gave us the opportunity to incorporate their input into our plans. As the product becomes more complete, we will have the opportunity to share our plans more broadly. Steven Sinofsky, Windows and Windows Live Engineering SVP, talks more about this in his interview with CNET's Ina Fried, published today: http://news.cnet.com/8301-13860_3-9951638-56.html. We know that this is a change in our approach, but we are confident that it will help us not only to build even better products, but also to be more predictable in the delivery of our products. We also know that this change has led to some confusion, so we would like to share information today that will hopefully clear up some of this. Before we talk about what's ahead, we should take a look at where we are today with Windows Vista. From a quality perspective, both Windows Vista SP1 and the ecosystem have delivered measurable progress in the six dimensions of quality we track -- device compatibility, application compatibility, reliability, performance, battery life and security. The business results speak for themselves. As of March 31, we had sold more than 140 million Windows Vista licenses, and analyst firm forecasts indicate that Windows Vista adoption among businesses is on a similar pace as Windows XP in similar timeframes. Millions of enterprise users are already running Windows Vista, and we invite you to read their stories published in more than 100 case studies. The benefits they are experiencing range from energy conservation, lower TCO for mobile users, and greater security. Our job is not done, but we've worked hard with our ecosystem to improve the quality of Windows Vista and we're pleased with the customer response. Another question we often get asked is whether Windows 7 is a major release. The answer is "yes" -- it's hard to describe any product that is used by millions of people and worked on by thousands of engineers as anything else. That said, the long-term architectural investments we introduced in Windows Vista and then refined for Windows Vista SP1 and Windows Server 2008 will carry forward in Windows 7. Windows Vista established a very solid foundation, particularly on subsystems such as graphics, audio, and storage. Windows Server 2008 was built on that foundation and Windows 7 will be as well. Contrary to some speculation, Microsoft is not creating a new kernel for Windows 7. Rather, we are refining the kernel architecture and componentization model introduced in Windows Vista. While these changes will increase our engineering agility, they will not impact the user experience or reduce application or hardware compatibility. In fact, one of our design goals for Windows 7 is that it will run on the recommended hardware we specified for Windows Vista and that the applications and devices that work with Windows Vista will be compatible with Windows 7. We are well into the development process of Windows 7, and we're happy to report that we're still on track to ship approximately three years after the general availability of Windows Vista. As always, we will be releasing early builds of Windows 7 prior to its general availability as a means to gain feedback, but we're not yet ready to discuss timing and specific plans for any Beta releases. In the meantime, customers can confidently continue with their Windows Vista deployment plans. Last week, Microsoft gave a teeny, tiny bit of information about the successor to Windows Vista, currently named Windows 7. There wasn't a lot of real meaty data in its disclosures, but it said enough to reset any expectations you might have that Windows 7 would be a radical departure from Windows Vista. Security firm Sophos has been poking around the Internet on the hunt for malware and found out that Google's Blogger service is the world's No. 1 repository for the evil code. Some 2% of all malware can be found on Google's servers. Google, time to clean house.